Todd talks about growing up in a farm and the animals they had there. Meg: Hey Todd, Did you have any pets when you were a kid? Todd: I did. I had many pets actually. I had a dog, of course, and I had some cats. But actually, I grew up on a farm. Yeah. 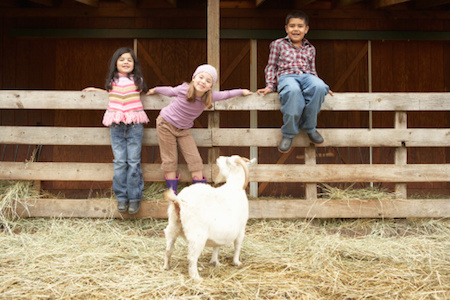 So we raised lots of animals, and on the farm, I always felt like the animals were my pets. So it was pretty cool. Meg: Wow. That sounds really exciting for a kid. Todd: Oh, it was great. It was the best. Meg: What kind of animals were on your farm? Todd: We had almost every, you know, farm animal possible. For example, we had pigs. We raised a lot of pigs. And pigs actually are really good pets. They're very fun. Pigs are very friendly animals and they're not really dangerous, so… Also pigs like people. So sometimes when we were little, we would ride on the pigs' backs but if our grandpa saw us riding on the pigs, he would yell at us. We always got in trouble. Meg: Also, aren't pigs dirty? Todd: They are dirty. So when you would go in the pig pen, you would get very, very dirty. But, you know, when you are small, when you are young, you don't care. It's just fun. Meg: What about other animals like chickens? Todd: We did have chickens and lots of chickens. And the chickens maybe were the least friendly animals. So chickens don't like people. Todd: And the chickens – you have to go get the eggs. So working with chickens was not easy, and I never really liked the chickens that much. Plus, the chickens you eat more often, so it's a little different. Meg: Yeah. I don't think I've ever seen a chicken in person. Todd: Oh wow. You must be a city girl. Meg: I am. Although, when I was young, I always wanted to have a horse. Did your farm have horses? Todd: We had one horse for a while, and then we had a pony. So yeah, we had one horse and we had one pony. The pony was great because when I was little, we could ride the pony but the pony was actually really mean. So the pony would bite you if you were not careful. And if you tried to ride the pony, sometimes the pony would get angry, very angry. But it's okay. You know, when you're small on a farm, it's normal. Meg: Oh, that pony sounds scary. Were there any other animals that you had that were more friendly? Todd: Yeah. Actually, the best pet you can have is a goat. Todd: Yeah. Goats are fantastic. Goats love people. They really, really love people, and they're very social. And goats follow people. So when you are little on the farm and when you walk around, the goats become your friends. So when I was little, I would walk and I had friendly goats that would follow me everywhere. And they were great, and they're very curious. They like to see what you're doing. And they like to be petted. So, you know, like how you pet a dog, you pet a cat; goats also like for you to pet them. They're very, very social. And it's interesting because goats and sheep are kind of similar but really, they're very different. So goats are very social. Goats are very friendly and sheep are very shy. And sheep don't like people at all. So sheep stay away from people and goats always get close to people. Meg: Hmm, sounds like a goat is a good pet to have. Todd: Goats are the best. They are so friendly. And goats are cool because goats talk to you. So they like to make a sound. You know, like, "Baa-a!" They "baa-a" or whatever, they make a sound. And when you walk around as a young boy or young girl, the goats are great. They follow you and you feel like the goat is talking to you, which is cool. Meg: That sounds really fun. Now I wish I had some goats. Todd: Yeah. Oh, you got to. The only other animal we had – we also had cows. Todd: And cows are cool. Some cows are friendly. Most cows are shy. But cows, you know, they always come to you because they think they will get food. But if they see you have no food, then cows stay away. So cows like sheep are a little afraid of people, but pigs and goats love people and they're very social. Meg: Oh, it sounds really cool, growing up on a farm. Todd: It was. It was. I was lucky. We always got in trouble. I was always getting in trouble as a kid. Try not to get in trouble. When you would go to the pig pen, you would get dirty. There is a pig pen on the farm. My room looks like pig pen. I've never seen a chicken in person. I met Tom Hanks in person once. I have never seen a lion in person. They like to be petted. I love to pet my cat becuase he has nice fur. Please do not pet the dog. Sheep stay away from people. Please stay away from the door. I try to stay away from bad people. So goats are very social. I try to be social at parties. He is shy and not very social. I do not use media much. I did not want to , but I did. The hogs live in a on farm. I have never seen a whale . Try to from the door.